Recognition by the international community as a democratic and economic leader in Africa has made Ghana a magnet for tourists, but few see the widespread poverty that still exists off the beaten path. 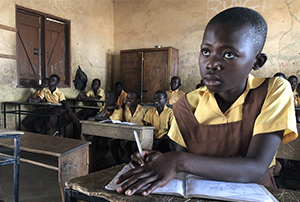 Catholic Relief Services Ghana works with the Ghanaian people to tackle poverty with a holistic approach including projects that improve child and maternal health; increase access to clean water and sanitation; scale up farm production; and enhance community level savings and lending. Health is the largest part of our project portfolio. Our work in Ghana is focused at the community level, where we are scaling up effective strategies to mobilize people through their local leaders to change cultural practices that impede the promotion of maternal and child health. By supporting communities and health facilities with emergency transport systems, medical supplies, and staff trainings, we improve the level of care for whole communities. We mobilize support for pregnant women and mothers of newborns to increase the child survival rate by addressing the behaviors that have been shown to limit maternal and child health services in the past. To reduce the incidence of malaria, we work to increase ownership and usage of long-lasting insecticidal mosquito nets. In the agriculture sector, we continue to focus our efforts on improving the production and livelihood capabilities of poor smallholder farmers. We introduce farmers to new technologies that are appropriate to their needs, while helping them save and access credit so they can increase their profits in local and regional markets. We work with farmers on the yam value chain introducing varieties and techniques to make their farms more productive and give them a role as seed suppliers, while also integrating others across the production, sale, storage and marketing stages. We also work to improve postharvest storage systems with sweet potato farmers to ensure stronger food security through the lean season and increase their profit potential. CRS Ghana continues to work in the water, sanitation, and hygiene sector. We improve sanitation coverage in schools and health facilities by working with school health clubs and sanitation advocacy groups to construct latrines, urinals and “tippy tap” hand washing facilities, as well as establish safe water points. We continue to integrate our Savings and Internal Lending Communities (SILC) programming into the WASH sector, which helps create a supportive environment for sustained behavior change. A lot of mothers and babies die during labor in Northern Ghana. With support from Helmsley Charitable Trust, we're working together to help more mothers and babies survive birth and the first 1,000 days of life. See how we’re making an impact. 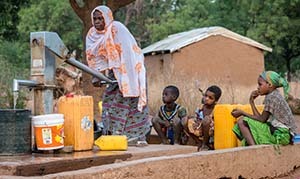 In Ghana, 5 million people still use water from unsafe sources. Learn how we're helping people gain access to clean, safe water and proper sanitation. Immaculate Azimbila is an outstanding student in Ghana. She’s learning about handwashing and sanitation at school. See how she brings that knowledge home and shares it with her family, helping to keep them healthy. 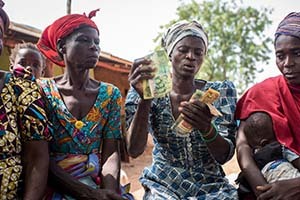 CRS has helped form 731 community savings and lending groups in Northern Ghana. Learn how groups serve as a platform for helping communities find their own way out of poverty and into increased financial security. Cllimate change affects small communities around the world and the key to resilience is a community that is united. CRS Ghana was established in 1958, just one year after Ghana gained independence. In our 50 plus years of service, CRS Ghana has established itself as a trusted and respected partner in Ghana's development. Since 1987, in the spirit of CRS' mission to work with the poorest and most vulnerable populations, CRS Ghana has served people living in the three most in-need regions: Northern, Upper West, and Upper East.